Gino B. Bardi was born in New York City in 1950, and lived on the South Shore of Long Island until he attended Cornell University in 1968, during the tumultuous era of Vietnam War protests. Armed with a degree in English/Creative Writing, he diligently sought work in his field and soon wound up doing everything but. For the next forty-four years he cranked out advertising copy, magazine articles, loan pitches and short stories while running a commercial printing company in Upstate New York. Along the way, he married his college girlfriend, became father to three lovely daughters and decided that winter was an unnecessary evil. In 2008 he sold the printing business, retired, and now writes humorous fiction in his home on the Gulf Coast of Florida. Two signs hang above his desk: "Bad decisions make good stories," and Mel Brooks' advice that "You only need to exaggerate a LITTLE BIT." 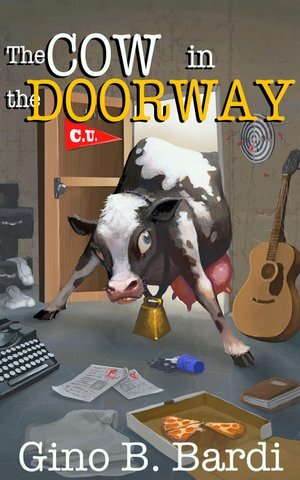 The Cow in the Doorway is his first full-length novel and won the statewide Royal Palm Literary Award for best unpublished New Adult novel for 2015.